Guitar George, I know all the chords, and I can play and sing your favorites: Fireworks, Dynamite, Call Me Maybe, Trouble, Rolling in the Deep, Moves like Jagger, Starships, Party Rock, What Makes You Beautiful, Gangnam Style, Who Says?, Drive By, Ceiling Can't Hold Us, and much more! Kids get to use all sorts of instruments and props as we sing and play their favorite songs! So, call Robert for your next school show. Robert brings children onstage to help him act out musical stories. 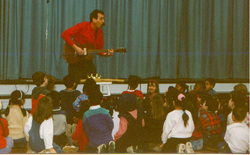 He serves as narrator and one-guitar orchestra as he prompts the children to act out each mini-play. Robert equips the children with hat-costumes and allows each child to add his/her personality and humor. The audience also plays a part. Robert’s superb guitar work and interactive style punctuate the messages of these stories. The character education lessons unfold in an unaffected, spontaneous way. While set in a “long, long ago” world, the stories address the daily problems and challenges of elementary school students.